We are both huge fans of the modern Olympics, and our trip was just a few months before the Athens summer games. It was so much fun to make a pilgrimage to the site of the original games, in the town of Olympia. The games began in 776 B.C. The photo on the left shows the original starting line on the track used for foot races. Note the grooves in which athletes placed their feet to get good starts. All but the most celebrated spectators watched the races on the lawn in the background. We ran our own little race on this field, and the sense of connection with history was amazing. At the Olympian games, winners were allowed to erect statues in their own honor. What's funny is that a row of statues of cheaters was also erected to shame them publicly. 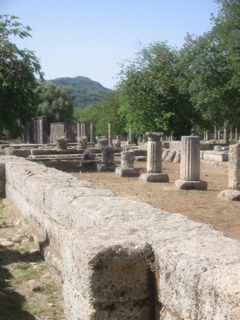 The athletic complex at Olympia was enormous, consisting not only of athletic fields, but also temples, barracks for athletes (see the photo on the right), and other buildings. While the complex is mostly in ruins, its scale is clear. As the tour bus pulled away from Olympia, Arthur was so pleased that the characters in the book he had been reading, Gates of Fire: An Epic Novel of the Battle of Thermopylae, had just arrived at Olympia. This book of historical fiction gives one a great feel for the lives of the Spartans, who were one group participating in the games. Travel with us now to Kardamali. Copyright © MMV by Arthur Allen Gleckler. All rights reserved.